Over 60 years ago, a two-pronged lift attachment was fitted to a power buggy (a materials handling machine, about the size of a wheelbarrow) and the rough terrain forklift was born. Today, they are a common sight on construction projects and lumberyards. The market for these strong, rugged cousins of industrial forklifts continues to grow, despite a tough economic climate, particularly for vehicles that have military or farming applications. 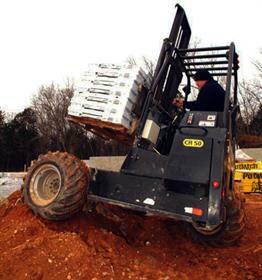 In the US, there are at least 20 different brands of rough terrain forklifts, with over 1,200 models to choose from. There is also a wide choice of rough terrain telehandlers, with more than 25 brands, and many of the leading companies like Manitou and JLG manufacturing both. Rough terrain vehicles are used primarily for work on rough surfaces to handle stacks of wood, pallets of concrete blocks and other handling jobs where there are no paved surfaces. Many heavy-duty rough terrain forklifts can carry several tonnes at a time, making them the perfect application for heavy work. Rough terrain forklifts come in a variety of configurations with two-wheel steering, four-wheel steering and four-wheel crab steering. They are typically powered by an internal combustion engine – generally diesel, which gives this tough machine the power it needs for acceleration and speed. The first four-wheel drive rough terrain forklift was introduced in the late ‘50s by Manitou, which started manufacturing this product in Ancenis, France. This was quickly followed by the first telescoping-boom rough terrain forklift in the ‘60s. The telescoping boom changed the way materials were handled on crowded construction sites, particularly where traditional industrial forklifts could not be used. Over the past 30 years, numerous improvements have been made on the telescoping boom and the automatic hydraulic frame to improve stability and load capacity, while enhancements of safety features have made this materials handling option an important tool. Accurate figures for the size of the rough terrain market are not publicly available, but a recent report by Yengst Associates in the United States put the North American fleet size in 2006 at 169,700 vehicles. Most of these (135,800) were telescopic-boom versions. Manitou remains one of the largest manufacturers of rough terrain forklifts and recently reported a 1.4% increase in 2008 revenue to EUR1.28 billion (USD1.7 billion). However, the company forecasts a significant drop in first quarter 2009 sales. Manitou says in a statement it would accelerate cost cuts and scale back production capacity amid a tough economic climate. Increased sales in Europe offset the collapse in sales of 75% of telescopic forklifts in Spain and a 30% drop in equipment sales in the UK. In November last year, Manitou temporarily shut production units in the wake of a fall in orders for rough terrain handling equipment due to the downturn of the European construction market. Manitou forecast a 20% fall in sales during the final quarter of the year (Forkliftaction.com News #386). Forkliftaction.com News asked the manufacturers of rough terrain forklifts and telehandlers for details of the size of their rough terrain sales. However, most were reluctant to share details of sales performance or marketshare. Paul Gibson, director of sales for Texas-based materials handling group Manitex International Inc, says the company manufactures LiftKing and Noble products. 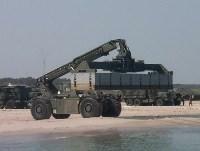 "These are mainly vertical mast rough terrain products with specialty and military/government applications." He says 95% of all Manitex’s production of rough terrain products are vertical mast and about 40% to 50% of total sales volume comes from rough terrains. Germany-based TERRA Deutschland GmbH concentrates on its niche market of sideloaders, four-way sideloaders and rough terrain forklifts. Norbert Häupler, one of the managing directors of the company, says being a niche producer means TERRA concentrates on particular segments of markets that are not well served by many of the big producers within the industry. "This is also true for the rough terrain trucks. Our models provide the highest quality for demanding special applications at high prices. "The total number of trucks we sell within the total market is irrelevant to us as long as we are successful within our niche. We do not report unit sales at all. "Being a niche producer, we deliver custom made solutions that others can't or do not want to deliver." Scott Whitaker, area product manager – Crayler for US-based Palfinger, says worldwide the company produces about 250 units per year. "We were the last to the market with our product and have been playing catch-up with the other producers. At the time we thought we had caught up, the economy dies." Whitaker says Palfinger only produces truck-mounted forklifts. "A rough terrain unit is considered to be a 4-wheel drive type unit with either a shooting boom or a straight mast and is not carried to the job site on a special mount kit on the back of a truck or trailer," he explains. "Our units are 3-wheel drive and are carried on a mount kit to make the delivery and then carried back to the supplier yard. "Palfinger is struggling along to make sales through its dealer networks, like every other company," he comments. "We have had layoffs at our assembly facility and are cutting costs wherever and whenever we can. "But other than layoffs, we don’t have plans for plant closures." Butch Hunter, sales manager for truck-mounted forklift manufacturer Princeton Delivery Systems, is reluctant to release sales and production figures. "However, 95% of our production is rough terrain forklifts," he says. Peter Grant, marketing manager for The Merlo Group, says of the 7,000 telehandler units produced, 6,200 were rough terrain telehandlers. "The balance is forestry tractors, tracked carrier vehicles and urban waste collection vehicles. "I have no market statistics for the proportional split between VRT/masted RT trucks, as we are not present in the masted side (of the market). My perception is that the masted market continues to decline." Stan Simpson, sales manager for Texas-based Kalmar RT Centre, says the company will produce approximately 125 to 150 units per year. All of Kalmar’s rough terrain products are of the telescopic design, with none being the mast-type design. Simpson says the current overall reduction of the telehandler business has not affected Kalmar’s business. "Ninety percent of our business is long-term contracted military sales." Kalmar is not looking to close any plants or lay off staff during these challenging economic times. In fact, the company will open a new plant in Texas in 2009. Rough terrain forklifts are used in a wide range of industries including mining, farming and construction, while there are also military applications. 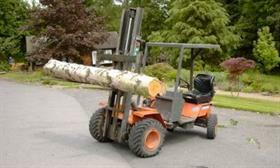 Some rough terrain forklifts can be used on all surfaces – rough and paved – and are referred to as all-terrain forklifts. Such equipment is able to transport materials from outside into the warehouse or other inside area. Deep tread tyres mean the vehicles can be used in most outdoor applications where the surface is uneven, slippery or rough. The large pneumatic tyres can traverse rocks, wood, sand, mud, snow and ice. Francisco T Sánchez Vilar, chairman co-ordinator of Spanish forklift manufacturer Mecano Continental S.A., says any company that has to manipulate materials in outside areas with non-concrete ground or uneven floors and harsh weather needs a rough terrain forklift. "The rough terrain forklifts ensure activities are conducted under safe, reliable and comfortable conditions." In Sánchez Vilar’s experience, demand for rough terrain forklifts comes from the armed forces, humanitarian organisations such as the International Red Cross, construction, energy, agriculture, mining and forestry sectors. Mecano manufactures a range of rough terrain and all-terrain vehicles for these industries. Last year, it launched a range of compact hydrostatic rough terrain forklifts – Micro-Range H13 and H16 – at CeMAT (Forkliftaction.com News #372). Elton Pearman, sales manager for Master Craft Industrial Equipment, agrees with Sánchez Vilar and adds that salvage, turf and logging industries also use rough terrain vehicles. Simpson says all of Kalmar’s products are sold for military-related applications. He has also found increasing demand from the shipping industry. "The drastic increase in containerised freight requires more versatile equipment to handle loaded containers in the adverse conditions." Kalmar manufactures a range of rough terrain container handlers that have the ability to handle 20- or 40-foot containers. Last year, Kalmar won a new USD125 million contract to supply the US Defence Department with rough terrain container handlers (Forkliftaction.com News #387). Princeton’s Hunter says its equipment is used primarily on commercial construction sites but is a slightly different market. "Our typical customer (or market) is the distributor of building materials - lumber yard or brick/block plant. They use the PiggyBack to offload and deliver the building materials to the point of use on residential/commercial job sites. "The need to deliver products to retail distribution sites over snow or uneven terrain is growing." 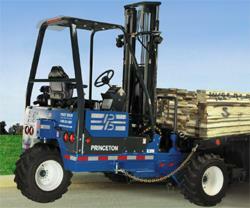 Ohio-based Princeton Delivery Systems designs, manufactures and sells the PiggyBack brand of forklifts. Princeton is part of the Hiab Load Handling Group of Cargotec Corporation. Josep Soler, export manager for AUSA, a Spanish manufacturer of dumpers and all-terrain forklifts, says the company’s main customers are based in the rental sector. 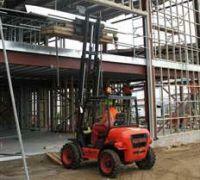 He reports strong demand for compact rough terrain forklifts that are used in vertical construction. "They are used as a feeder to the tower cranes and as a logistic machine on job sites where the terrain conditions demand better grip and more gradeability," he explains. "The customers that use this type of machine have discovered a more efficient way to handle the logistics on construction sites and the main difference is the compactness of the machine. This allows the machine to perform jobs that before we thought could not possibly be done by any rough terrain forklifts." 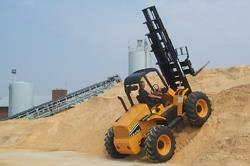 AUSA is the leading manufacturer in the world of rough terrain, vertical mast forklifts up to 3,500kgs (6,000lbs). In Spain, the company’s market share is 70%, in Europe it claims over 50%, and 20% worldwide. US-based loading specialist Palfinger has found the truck-mounted industry is closely tied to home building. Whitaker says the products delivered by these units make deliveries at the job site easier to place. "With the global recession in place now, home building has almost stopped and demand for our type product has slowed. We are always looking for other applications." Regardless of the type of product or industry, customers all want the same thing - quality, reliability and durability. Princeton’s Hunter says its main customers are distributors of building materials and they expect vehicles that help them manage the increasing cost of running a business. "With higher fuel prices and a stagnant building market, customers are interested in lighter, smaller machines that can fit to lighter, smaller delivery vehicles." Soler says AUSA tries to anticipate its customers’ demands. "That is the reason we launched the compact machines," he explains. "Customers need more efficient machines, reliable, compact, easy to use, low maintenance, trouble-free, and quick response. "We are focused on addressing these new needs and because we understand that, we use it as our main weapon to open a gap between our competitors." Palfinger’s Whitaker does not believe customers’ demands are changing. "Time spent waiting to be unloaded at the delivery site costs money," he says. "Our product makes deliveries faster without waiting, and puts the product where the end-customer wants it." He says Palfinger are focusing on quality improvements, operator comfort, and service access to make its units better to operate and easier to service than competitors. Mecano has been working over the past few years to ensure the changes to its products meet its clients’ needs. Sánchez Vilar says the Mast Explorer has revolutionised the rough terrain forklift market through the incorporation of new standard and optional equipment: "Equipment like double free-lift cylinders, integrated side-shift or fork-positioner, new cooling systems, multifunctional joystick with inching, air conditioning, and three new Mast Explorer ranges - Micro Range, High Range and Heavy Duty Range." "We have introduced the new Flowtraction system, which offers major elasticity and powerful traction in high-pressure working conditions," he says. Master Craft Industrial Equipment’s Pearman says the company has seen changes in the vehicles’ capacities and more reliable powertrain components. Looking to the future, the company will focus on environmental aspects and operator safety. "The next big thing in the rough terrain forklift industry is the new emission standards," he comments. "These standards will increase performance and fuel economy by lowering fuel consumption - leading to increased productivity. The newer engines are much quieter, which reduces risk of hearing loss and forklift accidents." Simpson from Kalmar says more modular build concepts with less on-site repairs and more exchange of major items have been the major changes he has seen. "Up-time and lower direct support costs is the primary focus these days." He sees rough terrain forklifts in the future being lighter and smaller. "These machines are becoming more popular with our customers." AUSA’s main innovations have been primarily adaptations to accommodate the different markets it sells to. Soler says the company has improved the ergonomics, engine power, visibility and turning radius of its vehicles. Soler says AUSA has started work on the next big thing in rough terrain. "It is a machine that will represent the culmination in compactness, capacity, reach, stability, and power. "It is going to be a machine that will balance the best features of different machines into a unit that has never been created before." Soler explains many in the market think of rough terrain forklifts as "big chunky machines". 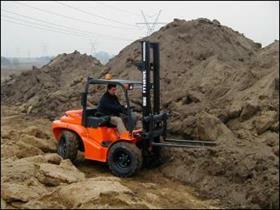 "There are advantages in using a compact rough terrain forklift. Many think they are unable to perform and understand the task of the construction industry." He says the new machine will change that. "This type of machine has potential in some applications," he says. "The compact rough terrain forklifts will bring more value to the industry and create a new segment." Palfinger’s Whitaker agrees new emission laws will impact on designs. "As hybrid diesel engines get more refined, smaller and less expensive, there will be attempts made to incorporate this technology. However, this type of equipment is not run constantly over extended periods, so the savings are hard to justify for the cost." Princeton’s Hunter says customers looking for more flexible rough terrain equipment for non-truck mounted applications have drawn the company outside its standard market. "Our three-wheeled, rough terrain machines are designed to be light and highly manoeuvrable on a job site," he explains. "There are various applications that require rough terrain machines with a very small turning radius and good stability. "Demand for truck-mounted machines that can traverse semi-rugged terrain and still deliver to areas with low overhead clearance is interesting to our customers so we have developed some ‘Lo-Pro’ variations of our standard equipment." Hunter says innovations in the design of truck-mounted forklifts continue to bring safer and more stable equipment to the market. "Princeton will continue to focus on safety, performance and reliability." Rough terrain forklifts and telehandlers offer a range of industries an option that can be adapted to surfaces that are uneven and rough. The all-terrain gives companies the option to have one vehicle that can be used inside and out. Manufacturers are focusing on producing machines that can withstand tough conditions but have less impact on the environment, be more compact and versatile. And despite the downturn of the market, many of the rough terrain manufacturers are looking forward to expanding their offerings.